Enjoy lunch and a glass of local wine, simply sip a cup of coffee and take in the stunning views, or enjoy a casual game of chess at Loie’s: The Museum Café. Specially priced Maryhill Brown Bag lunches are available to groups of 10 or more; advance notice is required. Loïe’s: The Museum Café is open from 10:30 a.m. to 4:30 p.m. daily between March 15 and November 15. 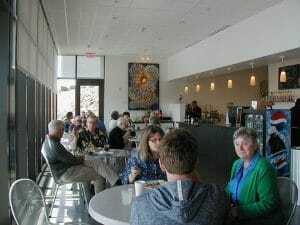 The cafe is accessed through the museum’s main entrance, and is located at the south end of the Terrace Level of the Mary and Bruce Stevenson wing. View museum map. Dining options for groups include Maryhill Brown Bag lunches and custom treats; we can also offer a wine and cheese reception or other forms of hospitality for your group. Contact Loie’s manager Jacque Francois at 509 773-3733, ext. 33 or by email at visting@maryhillmuseum.org for more information and to make arrangements.